This programme is from Roger Stevens. Does anyone have any details of this meeting? 5 July 2011 : Duncan Luke now has proof that this was NOT a team match, but an individual event featuring riders from these four countries. 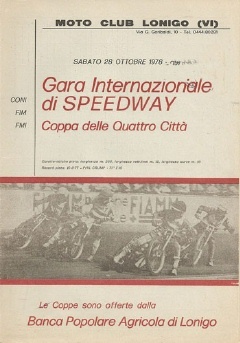 This was one of a series of meetings staged in Italy by English promoter Mike Parker. "I have the programme for the event but it is not filled in. As noted this was a Mike Parker promotion. 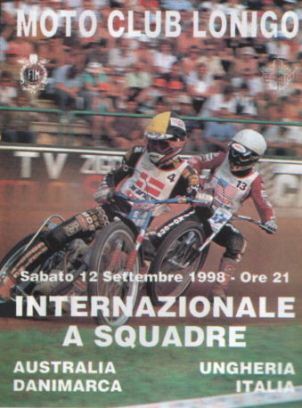 However, the meeting was not a genuine international but rather a low key event featuring only eight riders brought in from the UK to race there and at another nearby track he operated at Rimini. The "International" label looks as if it was a convenient way to help promote the event as most of the riders are (I believe) Englishmen. e.g. Caisley may have been a Scottish junior but I have never heard that Jack Winstanley had any claim to Scottish relatives! The make up of the teams (Pairs would be a better term) was :- England - M. Robinson and P. Sharples. Australia - G. Beattie and A. Paynter. New Zealand - P. Harris and B. Oliver. Scotland - J. Winstanley and M. Caisley"
12.01.09 Andy Reid points out that M Caisley was erstwhile Newcastle junior rider Milton Caisley, and probably English. 17.01.10 Kevin Twohigg has now kindly supplied the programme - and full details - of a second match held the next day. 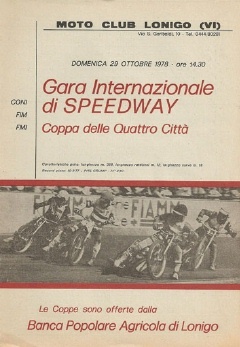 This was the first ever speedway meeting at Rimini. 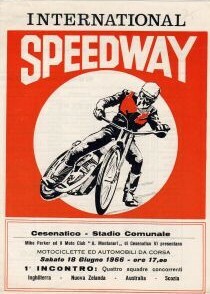 After 10 heats of speedway, the same 8 riders took part in 6 races of (midget?) car racing. 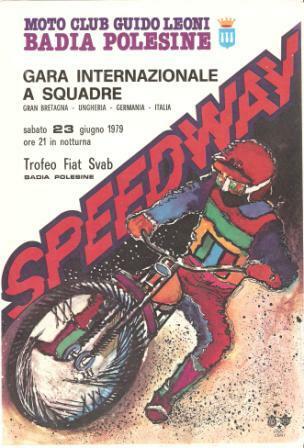 Note: Guiseppe Marzotto rode in these matches as "Charley Brown"
David Austin writes: "The England side was essentially a Canterbury Crusaders team, and consisted of Mike Ferreira, Barney Kennett, Denzil Kent, and Dave Kennett of Eastbourne as a guest. The Team Manager was Maurice Morley. The invitation to participate in the meeting was a result of the hosting by Canterbury of the Italian touring team earlier that season"